New to Commun.it? Start here! Welcome to Commun.it! We’re thrilled to have you on board. Commun.it is here to help you make sense of social media. Unlike the many other social media platforms around, we do so much more than social media management. We’re a social media intelligence platform which provides actionable insights to help you grow your community and boost your engagement. Our approach to social media is a little different. We believe that when it comes to building a thriving community, social media strategy is less relevant. The way we see it, it’s the relationships you build with members of your community that matter most. Relationships are at the heart of any thriving community. We designed Commun.it with this thinking in mind. In fact, if you look closely, you’ll notice that every insight we provide aims to help you build meaningful connections with your community. Ready to dive in and start growing your community? Let’s get started. Commun.it is a social media intelligence platform which provides insights and comprehensive analysis to help you grow your social media community. We’ve created a sophisticated algorithm which analyzes your Twitter profile and social interactions and suggests actions you can take to boost your engagement. In our experience, using Commun.it for just one hour daily can save you hours of work. Community management in its current form is outdated and desperately needs to be reinvented. After all without measurable insights, few business owners are willing to invest in social media unless they can prove it impacts their bottom line. We understand these pain points and designed Commun.it to help you get the most out of your social media activity. Many companies are left wondering: How do I turn social media into a business value? Why should I invest in community management? Our goal is to change that paradigm. We aim to translate the relationships that were built on social media into business goals. Inbox - See all your mentions, DMs and replies. Reply or review to remove from the feed and get to Inbox Zero for the day. Followers - Manage your followers: who to follow/unfollow, whos not following back, who to unfollow, etc’. Leads - See specific tweets from people looking for services you provide or content you write and share. Engage them and make them customers/followers. Content - Find top tweets and activate Share Top Articles to find relevant content to share with your followers. Schedule - Compose new posts or schedule articles for posting throughout the day or week. Reports - Articulated, downloadable reports on your tweets and social engagement. Recent Followers - A list of all recent followers. Recent Unfollowers - A list of all recent Unfollowers. Consider to follow - Users recommended you follow by our algorithm. Consider to unfollow - Users recommended to unfollow due to them not following back, being inactive or not engaging back with you. White/Black list - Hides users your on the fence about. 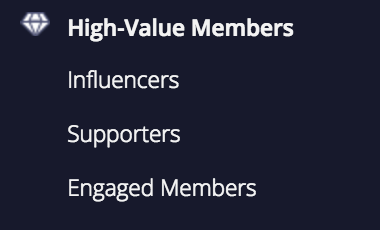 High value members - Filtered according to Influencers, Supporters and engaged members. Social feeds - Any social media feed you've linked with Commun.it will appear here. Tags - Tweets you've tagged in a certain tag to help find later on. Search by keyword - Any tweet which contains these words will surface in the feed. Search by bio - Searches for custom words in users' bios and brings their tweets. Share Top Tweets - Find valuable tweets to retweet with your community. Share Top Articles - activate this feature to find hundreds of articles in your expertise to share. Website Widget - A branded widget which is displayed on articles you share via Commun.it. Scheduled - Any tweets and top articles awaiting to be published throughout the day/week. Published - All published tweets. Best time settings - Customize the best time to publish your tweets for maximum engegament. Message Campaign - An automated response to unreplied tweets set at 30 from receiving them. Recurring campaigns - Schedule automated tweets (no mentions) on a daily/weekly basis. Activity Report - Your Weekly activity report: how your tweets, mentions, favorites, retweets performed. Engagement Report - See tweets which mentioned you and hoe they performed. Global Filter - Filter out Tweets containing a specific keyword, author or hashtag. The dashboard can be accessed via the profile drop down in the top right of the screen Here you can see what actions you need to take to grow your community at a glance. You’ll notice that the dashboard is divided into different sections including Share Top Tweets; Thank New Followers and Consider to Follow among others. We recommend reviewing this dashboard on a daily basis, but keep in mind that the recommendations we make are just suggestions. It’s up to you to decide whether or not to perform a specific action like sharing a top tweet or unfollowing a user. This dashboard is here to take the hassle out of basic community management by giving you a daily task list of actions to perform and refer to. A selection of the most popular tweets in your community. We rely on our algorithm to select these tweets. A clever way to increase engagement is to like or share these tweets. We recommend reviewing these tweets on a daily basis. A list of users we recommend you follow: These recommendations are based on how engaged and influential the users are as well as how relevant they are to you and your community. We recommend reviewing this list on a daily basis. For best results you should review a user’s profile before following. A list of users we recommend you thank for retweeting you: These recommendations are based on how engaged and influential the users are as well as how relevant they are to you and your community. Thanking a user for retweeting you is an effective way to increase engagement. Keep in mind that every time you thank a user, a tweet is sent. We recommend spacing these tweets out to avoid overwhelming your followers. You can also use Buffer to schedule these tweets to ensure you have a well-structured feed with a mixture of content. You can easily customize the text of these tweets by changing the text that appears in the text box. We’ve found that personalized tweets perform best, so feel free to have some fun with these tweets. By starting your tweet with a user’s twitter handle (e.g. @commun.it Thanks for following) the tweets won’t appear on your main Twitter feed, but rather as part of your Tweets and Replies feed on Twitter. This makes the tweet more private and means that other users won’t see it unless they look at your Tweets and Replies feed. Note that these tweets will be visible when your Twitter profile is viewed on mobile. This is a list of people who have followed you. Increase engagement by thanking them. 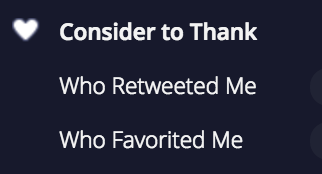 Keep in mind that every time you thank someone for following, a tweet is sent. A list of users we recommend you unfollow. These suggestions are determined by analyzing the engagement between you and the other user. For best results you should review a user’s profile before unfollowing. As a general rule, you want to have more followers than users you’re following. This feed will help you manage this ratio. There is no sort button, in order to sort by number of followers. However, our internal logic includes parameters to choose and rank users on that list (one of them is the number of followers). These are the people who’ve engaged you, and we recommend you engage back. This list includes your most recent unreplied messages. 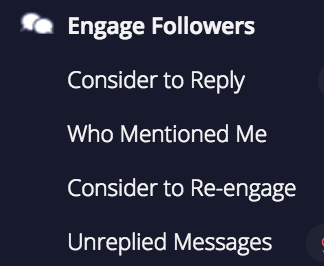 This list is sorted so that engagements from the most important people in your community will appear first. If decide not to reply to these tweets, you can retweet or like the tweet. These are your high-value community members: the members in your community who are the most engaged. This is where you can thank these members for being the most engaged members of your community. Thanking these users is a good way to boost engagement. For an in-depth understanding of what’s happening in your community, there’s the Community Dashboard. Here you’ll get a better sense of how well your social media activity has been working and what changes need to be made. This dashboard is divided into different sections for ease of use and improved navigation. You can either move from top to bottom reviewing section by section or you can simply skip to the sections that are most relevant to you. The Community dashboard can minimize the time you spend managing your community, making you more productive and efficient. This dashboard goes beyond basic community management and gives you an understanding of your community members and what actions need to be taken next to achieve your social media goals. 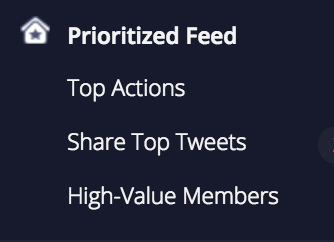 When managing your community, a good place to start is by reviewing the Prioritized Feed. Here you’ll find the most important community members and actions we recommend you take first. This feed is divided into three different sections: Top Actions; Share Top Tweets and High-Value members. We recommend that you review each of these feeds on a daily basis. Top Actions: The Top Actions feed highlights valuable members of your community and their actions. You can engage with these members by replying, liking or sharing their tweets. There is also the option to follow these members directly from this feed. By reviewing this feed closely, you’ll see whenever an important community member mentions you or shares something of interest. Share Top Tweets: Here you’ll find a collection of tweets from your most active and influential community members. These users are generally influencers. By reviewing this feed closely, you’ll have a good sense of what matters most to your community. You also have the option to engage with these tweets by liking, replying or sharing them directly from this feed. High-Value Members: This feed is a collection of users who interact regularly with you. This includes users who like, share or reply to your tweets. It’s a good idea to monitor this feed closely as you want to engage with these users back by thanking them or perhaps replying to their tweets. This feed gives you a good idea of how your community is growing. It includes users who have followed, unfollowed and are not following you back. In addition, here you’ll find recommendations for who you should follow or unfollow to continue growing your community. New unfollowers: These are users who recently unfollowed you. It’s useful to keep a close eye on this feed; if you have many recent unfollows, it may be time to tweak your social media strategy. New followers: Here you’ll find users who followed you recently. We highly recommend reviewing this feed on a daily basis and engaging new followers where relevant. From this feed you can follow back, thank users for following and view their profile. Consider to unfollow: This is a feed of members which we recommend you unfollow. We rely on our sophisticated algorithm to make these recommendations and take into account factors like how many followers a user has as well as the kind of interactions you’ve had. This feed needs to be reviewed carefully, and be sure to keep in mind that you may still want to follow someone even if our algorithm has flagged them as someone to unfollow. Consider to follow: This is a feed of members we recommend you follow. 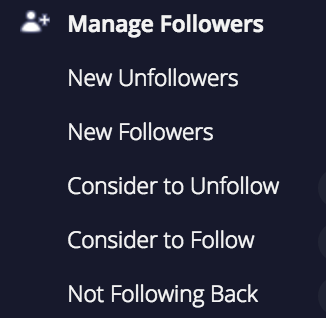 We rely on our algorithm to make these suggestions and take into account factors like how many followers a user has as well as the kind of interactions you’ve had. We’re more likely to recommend you follow members with lots of followers who have interacted with you. Be sure to review these suggestions carefully, and only follow users you think are relevant. Send them a direct message telling them that you’d like to connect. Send them a tweet wishing them a good day or week. Like one of their tweets. Share one of their tweets. Respond to one of their tweets. This feed is where you come to do the heavy lifting. Here, we make suggestions for daily actions you can perform to grow your social media community, and boost engagement. This is where you should come when you’re looking to engage your community meaningfully. Consider to reply: This is a feed of users who have engaged with you. We use our algorithm to sort this feed so that interactions from the most important users appear first. It’s a good idea to review this feed on a daily basis so you don’t miss any important engagements. Who mentioned me: This feed consists of all mentions of your Twitter handle and includes both mentions and retweets. To ensure you don’t miss any mentions or retweets, this feed is sorted to feature the most interactions first. Consider to re-engage: This feed consists of high-value members you haven’t engaged with for over a month. It is sorted to feature the most relevant and important users first. Unreplied messages: Here you’ll find any direct messages you haven’t replied to yet. Direct messages are private and the interaction can only be seen by you and the sender. It’s a good idea to review this list daily so as not to miss any important messages. This feed provides a breakdown of your social media community. Here you’ll get a good understanding of how your different community members interact with you. Focusing on this feed will give you a good sense of which community members to engage with in order to grow your social media presence and boost engagement. This feed includes all the users who have interacted positively with you by either retweeting or favoriting your tweets. We recommend that you review this feed carefully, and remember that you may not want to thank everyone who retweets or favorites. You can use thanking as a strategic tool to help you grow your community, and build meaningful relationships. Who Retweeted Me: This feed consists of all the users who have retweeted you. It is sorted so that retweets from important and influential community members appear first. Who Favorited Me: This feed consists of all the users who have favorited your tweets. It is sorted so that tweets from important and influential community members appear first. The Business Intelligence feed helps you monitor how your brand or company is perceived on social media. Divided into negative and positive mentions, this feed helps you measure brand sentiment. Carefully monitoring this feed will enable you to respond to any customer complaints as they arise. Share Positive Tweets: These are positive tweets about your brand. In addition, you may find positive reviews and testimonials in this feed. It’s worth monitoring this feed carefully so you can nurture relationships with these brand ambassadors by thanking and retweeting them. Reply to Negative Tweets: These are negative mentions of your brand. They include mentions and retweets. It’s important to monitor this feed on a daily basis so you can deal with any complaints or negative feedback in a timely manner. This is one of the most effective ways to manage how your brand is perceived online. Here you can track mentions of your brand including any keywords and websites related to your company. This is more comprehensive than simply tracking mentions as it enables you to find permutations of your brand name that Twitter wouldn’t ordinarily detect. This includes misspellings as well as any unusual spellings of your brand name. From this feed you can interact with users by following, retweeting, liking or replying. It’s important to monitor this feed closely to ensure you don’t miss any important mentions of your brand. Groups are a simple way to manage your community members. 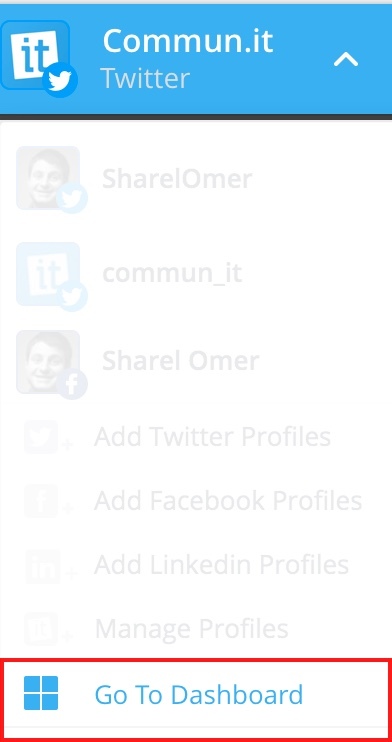 You can import your existing Twitter lists (both public and private) to Commun.it. They will then appear under the My Groups feed. You also have the option to create a new group from the Commun.it platform. While you can import your Twitter groups, it’s important to remember that any changes you make to a group won’t affect your lists as they appear on Twitter. It’s also worth noting that Groups are private and are feeds that can only be viewed by you. Groups create a unique feed which sorts members based on their recent interaction with you. This is unlike a Twitter list which is sorted based on a user’s most recent tweet. It’s useful to think of Groups as tags or labels. These Group labels will appear throughout the platform. 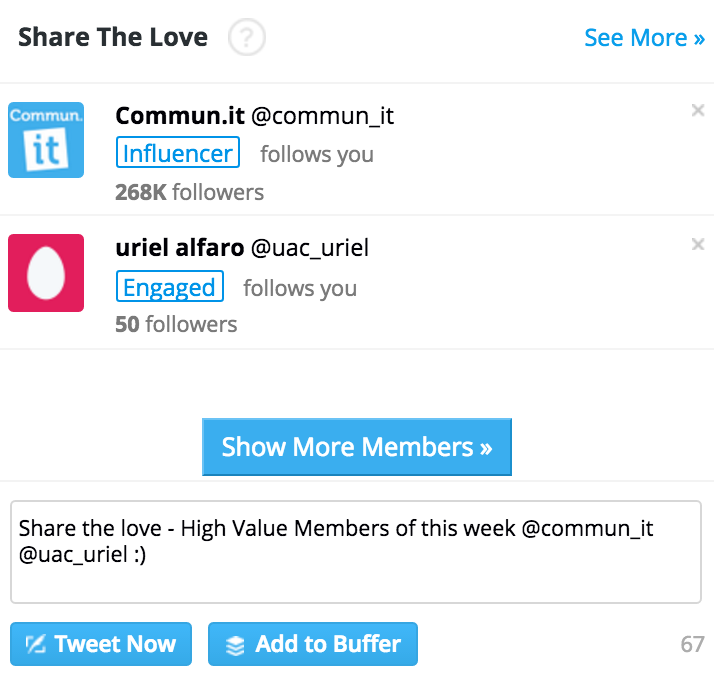 For example, our platform may flag a user as someone to unfollow. When you review this user, you may notice that they’re part of a group which could impact your decision to unfollow. The Leads dashboard is where you can monitor and track any keywords and hashtags of interest. There is also the option to track competitors and keywords as they appear in someone’s Twitter bio. The Leads dashboard is useful for growing your community as it helps you identify people who are talking about topics of relevance to you. The keywords feed is where you can add and monitor any keywords or hashtags of interest. To add a new keyword, simply click on the Add button. You’ll then be able to enter any keywords or hashtags you want to monitor. There is also the option to filter these keywords by location, sentiment or search phrase. Once you’ve added a keyword, you’ll see a feed with all the users who have mentioned this keyword or hashtag. From this feed, you’ll be able to interact with these users by following, favoriting, replying and sharing relevant content. Monitoring this feed is a great way to grow your community as it gives you insight into who is talking about a topic that interests you. Here you can find people based on the keywords they’ve used in their Twitter bio. 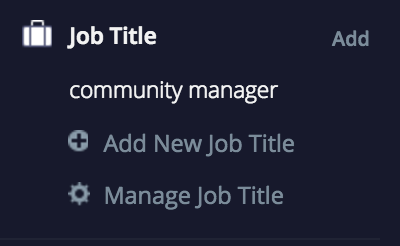 To add a new job title, simple click on the Add button. You’ll then be able to enter any job titles you want to monitor. There is also the option to filter these keywords by location, sentiment or search phrase. Once you’ve added a job title, you’ll see a feed with all the users who have used this keyword in their Twitter bio. From this feed, you’ll be able to interact and build relationships with these users by following, favoriting, sharing or replying to their tweets. This feed can come in handy when trying to target a specific audience and can help you reach a new audience. The competitors feed is useful as it shows you influencers who follow your competitors. Once you’ve added a user you consider a competitor, our algorithm will find users who follow this competitor. The feed is sorted to feature the most relevant and influential users first. This feed is useful to monitor and can help you grow your community as it gives you a sense of users who are likely to be interested in your social content. You can reach out and engage these users by favoriting, sharing or replying to their tweets. The Schedule dashboard lets you schedule social media posts and plan your content ahead of time. This will save you time in the long run, and will make it easier to reach the most relevant members of your community. Scheduling social content is one of the most efficient ways to grow your community and generate meaningful engagement. Weekly Scheduled Messages are easy to activate under the " Schedule" tab. When you first click on this tab, you’ll be asked to activate campaigns (see below). Note that once do this, a few generic campaigns will be set to run. We recommend that you review these campaigns, edit them accordingly and pause the ones that aren’t relevant. You can either edit an existing campaign by clicking on the " Edit" button located on the right of the campaign name. 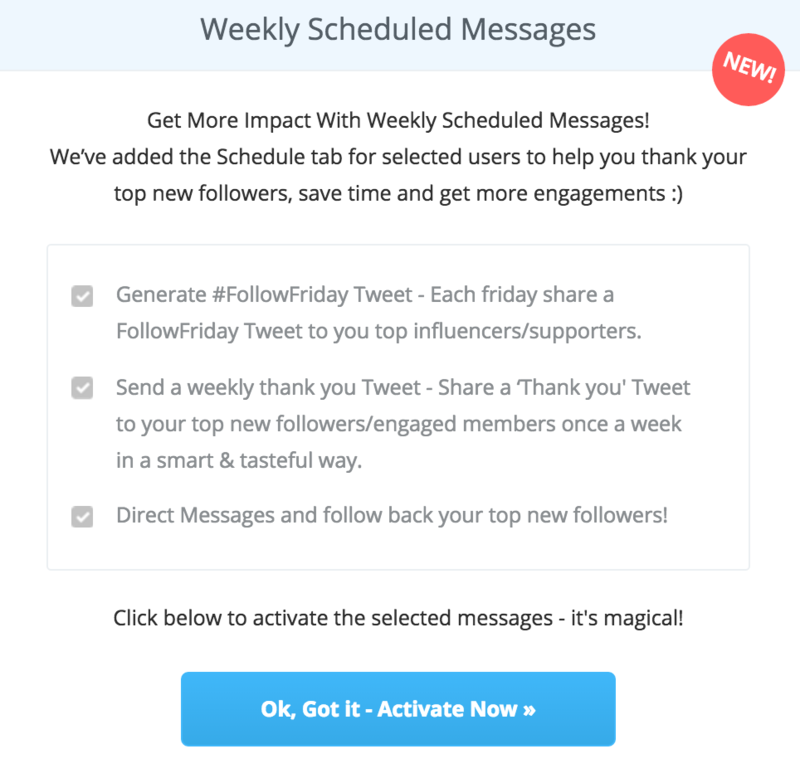 Or, the other option is to create a new Weekly Scheduled Message by clicking on the " Schedule New Message" button. Both the " Edit" and "Schedule New Message" buttons open a page where you can customize Weekly Scheduled Messages. Now it’s time to customize the actual message that will be sent. We highly recommend tailoring this message to suit your target audience. This, not only ensures that the message is more relevant, but is one of the best to boost engagement. Add an image: An easy and effective way to customize Weekly Scheduled Messages is to add an image. You can add an image to all messages except to Direct Messages. Feel free to get creative with the image. Your followers are more likely to react to an image which makes them look twice. It’s also a good idea to choose an image which compliments your text. Experiment with how you start messages: By moving the <users_list> text to the front of your message, your message will be more private. This means that instead of appearing as part of your main Twitter feed, it will appear under the Tweets & Replies Twitter feed. This simple tactic makes it easier to target relevant community members and helps keep your Twitter feed clean and relevant. Pay attention to the message preview: Before scheduling your message, be sure to review the message preview which appears at the bottom right. This will give you a good idea of how the message will appear when sent. You can make any final changes to the message by clicking on the text box next to it. Remove "(via Commun.it)" from tweets: With Commun.it’s premium plans you have the option to remove the Commun.it link. Set an exact time for your message:While the Commun.it algorithm automatically determines the best time to send your messages, you may want to customize the time. Please note that this option is available to premium members only. The Reports Dashboard gives you in-depth insight into your social media community and how it’s growing. By monitoring these analytics carefully, you’ll have a good sense of what actions you need to take to boost engagement and reach your social media goals. This report gives you a general overview of your social media activity. Here you can see a breakdown of the retweets and mentions sent and received. This snapshot view also gives you an indication of how your community is growing as well as how many posts you sent. You can filter this data to view a custom data range, the last three days, last week or last month. This report gives you an in-depth glance into how users in your community engage with you. Here you can see all the users who have engaged with you as well as their post which mentions you. In addition, you’ll see information about the user like how many followers they have and how many times they’ve mentioned you. It’s a good idea to review this list on a regular basis to see if there are any users to thank, retweet or engage with. The Global Filter lets you filter out tweets which contain a specific keyword or hashtag. You also have the option to filter out specific users. Keep in mind that anything you add to the Global Filter will be blocked from your dashboards and won’t appear in any of your feeds.